for both the implant and crown! - paid in 2 instalments. Additional costs may apply for bone augmentation. After an implant has been put into the jaw bone during a surgical procedure, a period of healing (usually 2-3 months) allows the implant to bond to the bone (osseointegration). The post is then used to attach a ‘fake tooth’ (either a crown, bridge or denture). 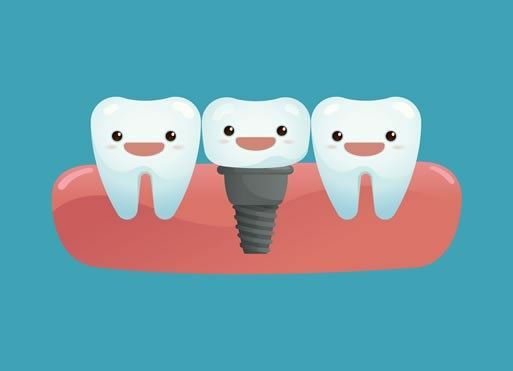 One or more implants can be used, depending on the size of the space and the number of teeth to be replaced. Implants aren’t suitable for everyone. Some health issues may affect the success of an implant as can lifestyle choices such as smoking. They also require looking after, just like natural teeth. If you suffer from gum disease, this can also affect the gum around an implant. Come and have a chat with us about whether you may be suitable for treatment and the costs involved.